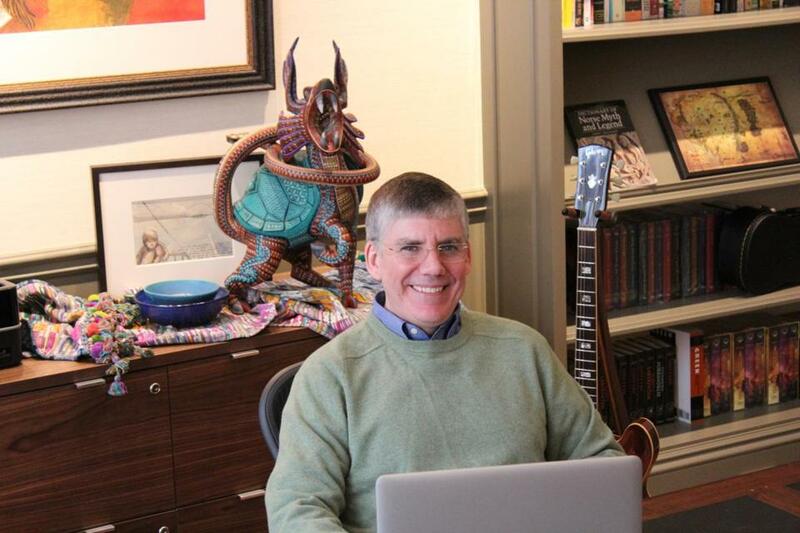 Rick Riordan, best-selling author of the “Percy Jackson” young-adult series who last year left Texas for the Boston area, is at work on books based in his new hometown. This is my older son’s first year in college. He wanted to do a creative writing program. We looked at many different colleges, and he really loved Boston. We were not sure that we wanted to be halfway across the country, and he really wasn’t sure that he wanted that either. We’re a very close family. So we relocated here in June and couldn’t be happier. Robert B. Parker is really the writer who got me into the mystery genre, and so everything I knew about Boston I learned from Spenser and the novels of Boston. Boston is a wonderful place for the culture that it offers, for the atmosphere, the history. My wife, who is from New York, feels very much at home here. Watching the seasons change and walking the cobblestone streets and all the old brownstones, this is all very familiar to her. I think for her it’s a really nice experience to be able to share that with me and our two boys. My next series is going to be on Norse mythology. Moving up here is kind of research for that, too, because it will be set in Boston. There are a lot of connections, which I didn’t really realize until I started looking into it, between the Vikings and Boston and Norse mythology. That will come out in 2015. In San Antonio, we bought a house about five years ago and found this sort of stormy green-gray paint color for the exterior that happened to be named Zeus. So we called the house Zeus House. And then when we moved to Boston, I didn’t plan it again, but we painted the interior of this 1870s house Athena White. So naturally this became Athena House. I can write anywhere, but this has been a really great place to write. The house has good writing karma. READ UP Riordan will have books out in August (Percy Jackson’s Greek Gods) and October (The Blood of Olympus).